Escalating drug prices are forcing state Medicaid agencies to explore new payment models. According to Burl Beasley, director of Pharmacy Services for Oklahoma’s Medicaid program, older Medicaid payment strategies, such as negotiating enhanced rebates and multi-state purchase agreements, are not keeping pace with rising drug expenditures. Beasley cited the strain prescription drug costs were putting on Oklahoma’s Medicaid budget as a driver behind the decision to pursue alternative payment models (APMs) during a Dec. 12, 2018 National Academy for State Health Policy (NASHP) webinar. The webinar featured Beasley, Terry Cothran, director of Pharmacy Management Consultants at the University of Oklahoma College of Pharmacy, and Russell Knoth, director of Health Economics and Outcomes Research at Eisai, a drug manufacturer that entered into an APM agreement with Oklahoma. Since committing to APMs, Oklahoma’s Medicaid agency has become a national leader, with four separate Medicaid APM agreements executed with drug manufacturers. Beasley drew an important distinction between the two main types of APMs — financial APMs and health outcome-based APMs. Financial APMs are essentially price/volume agreements and may include target measures such as adherence. Financial APMs, which can be managed with claims data, are easier to administer than health outcomes-based APMs, which often require clinical data. The four contracts that Oklahoma has executed to date are all financial APMs, though Oklahoma continues to explore potential health outcomes-based APMs. Oklahoma’s fee-for-service Medicaid payment model helped expedite the execution of APMs, which otherwise may have required additional negotiation and coordination with managed care organizations. 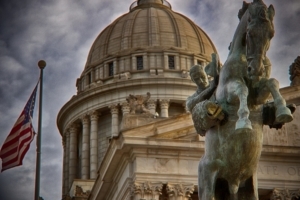 To enable Medicaid APMs, Oklahoma submitted a Medicaid State Plan Amendment (SPA) to the Centers for Medicare & Medicaid Services, and received approval for the amendment on June 27, 2018. The SPA allows Oklahoma to negotiate supplemental rebate agreements that could produce extra rebates for the state depending on a drug’s performance against outcomes agreed upon in the contract with the drug manufacturer. The extra rebates are excluded from “best price” implications, an important consideration to encourage manufacturer participation in APMs. Michigan has since followed Oklahoma’s lead, receiving approval in November 2018 for a SPA to enable APMs there. Both states received support from SMART-D, the State Medicaid Alternative Reimbursement and Purchasing Test for High-Cost Drugs, including development of a contract template. NASHP provided a grant to Oklahoma to support the extensive data analysis necessary to explore potential drugs and outcomes for measurement in order to execute contracts. NASHP provided the grant through its Center for State Rx Drug Pricing, supported by the Laura and John Arnold Foundation. Results, including assessments of potential cost savings, are not expected for any of Oklahoma’s APMs until 2019. In the meantime, Cothran was able to share some lessons learned from Oklahoma’s successful efforts to pursue and finalize contracts with manufacturers. Building a strong relationship and trust between the state and a manufacturer is necessary. Smaller manufacturers may have greater flexibility than larger manufacturers to enter into APMs more quickly. Manufacturers are new to Medicaid APMs and are generally not yet ready to take on high-risk contracts. State Medicaid programs should be willing to pull initial data on drug utilization to get manufacturers to the table. Knoth shared the manufacturer’s perspective on APMs, which he believes can be a win-win for payers and manufacturers. He stressed that though the concept of an APM is easy to grasp, transitioning from the concept to a signed contract can be challenge because it requires designing an agreement with the power to measure a real effect. Eisai’s contract with the Oklahoma Health Care Authority measures reductions in hospitalizations following initiation of its epilepsy drug Fycompa, and is Eisai’s first APM. Read a Q&A about how Oklahoma implemented its APM and how it plans to evaluate and expand this innovative model here. For more information about this ground-breaking APM, listen to a recording and view the NASHP webinar Medicaid Alternative Payment Models for Prescription Drugs: Do They Add Value for States?